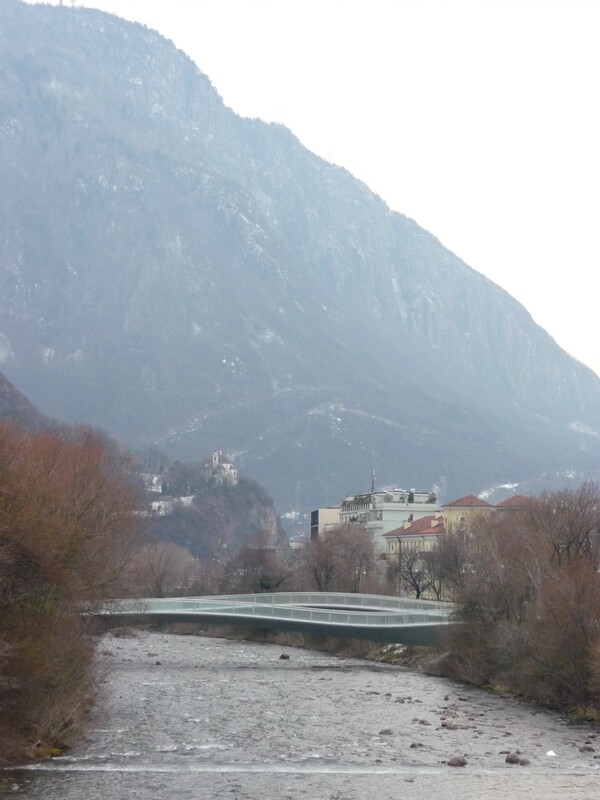 So there I was, in Bolzano for a business meeting (quite cool acutlly, a PhD comittee meeting about a thesis on interaction design for deaf children). My first attempt at consuming as little and as sustainable as possible while traveling. It wasn’t too difficult, actually. The thing that I found most awkward was spending time in city centres (and at airports) with the knowledge that I couldn’t buy anything. It made me look at shops and city streets in a completely different way! Actually, who would ever have thought I would say this, I lost almost all of my interest in shopping! I had a few hours to wander through Bolzano and I automatically started looking for shopping streets. But since I lost interest after a few minutes, I just wandered around, watching beautiful old buildings and took a stroll along the river. When I got back at my hotel, I thought I had walked for at least two hours, while in realt it was only 1 hour and 20 minutes! The thing I thougt would be most difficult was eating. Of course, I was quite limited in my choice of where to eat. I had breakfast in the hotel and the people who organised the meeting took me out for lunch. I haven’t found any organic food, but I was able to make some choices. At breakfast I ate nothing that was packaged and I did not eat out-of-season and out-of-location fruits. I ended op eating muesli with seeds and yoghurt, a croissant with (not prepackaged) jam, a cappuccino and home made (!) apfelstrudel. Lunch was a vegetarian pizza (with artichoke cream, eggplant and courgette). Eggplant and courgette probable were local, mabye in the south of Italy they even grow in winter, who knows! I had dinner in the cafe of my hotel. Polenta (very local!) with mushrooms and gorgonzola. Also not too bad I guess. And I asked the waiter which of the red wines was local (there was one from Bolzano even, which was lovely!). One dilemma was the hotel sauna. They had a small sauna complex which was open every afternoon and evening. I really felt like going to the sauna, but I wondered how unsustainable that would be. Of course, the sauna was on, whether I would go in or not, but I hate to use such an argument (“the plane is flying anyway, so I might as well take it”). Eise thought sauna’s are not very unsustainable, because they are isolated very well. I ended up going (which was great! ), but I noticed that the heating system went on about every minute or two… And I got two towels and a set of disposable slippers… Anyone an idea about the energy usage of a sauna? On my return trip I hardly consumed anything. I filled the bottle of water I got at Rome airport with tap water (which they are very proud of in Bolzano, straight from the mountains). In a supermarket I bought organic mais crackers and some (local) fruit. I took a train to Innsbrück, then a bus to the airport and from there I flew to Brussels (where I took a train to Maastricht). I ate all the stuff I brought for lunch, so I didn’t have to buy a thing. So all in all, this first consumeless trip was quite OK, I think. Next time I’ll definitely try to go by train and I’ll try to find more sustainable hotel options (now I stayed in the hotel that was suggested to me). Yesterday I had to travel to Italy, to be part of a PhD commission. So I had to consume as little as possible while traveling. Not so easy. It was a long trip, had to take the train to Brussels and fly to Rome first, where I had a very long stay over. Next, I had to fly to Bolzano (in a tiny tiny plane, with propellers!). The first part was easy. The only thing I missed was buying a cup of coffee on the train station. Unfortunately, the train to Brussels (which runs only once every hour) was cancelled so I had to call Eise to drive me to Liege to take a train there. Not the most sustainable option, but the only option. At Brussels airport I didn’t consume anything. I did plug in my laptop to a power socket to work a bit. In the plane I very economically asked for two drinks so I didn’t have to buy so many drinks during my stop over. I was pleased to see that they did not have cans or bottles of drinks in the plane. Everybody got a (plastic) cup of water, juice or soda from a large bottle. 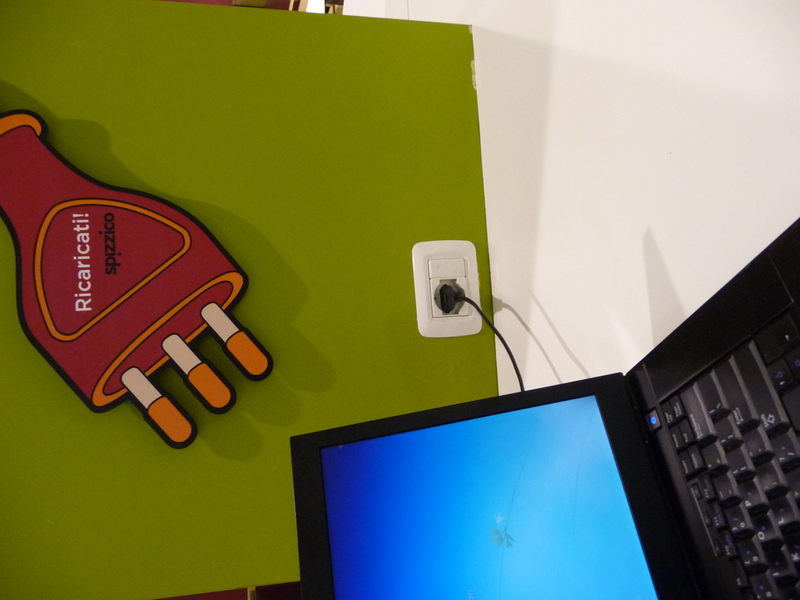 At Rome airport, I really needed to plug in my laptop again to finish my work. And really, there were no publicly available power sockets, not a single one! How do the cleaners vacuum that place? They need electricity! But I finally found two cafés with one socket each. So during my stay over I bought two cups of espresso to be able to use some electricity :-s.
I had supper at the airport as well (I did bring my own sandwiches for lunch!). I had a vegetarian pasta and a bottle of water. No other choice than a bottle, unfortunately. But I kept the bottle to refill it for the remainder of my stay at the airport and in the plane. As for the pasta, I planned to choose seasonal and local ingredients, but I’m afraid no seasonal ingredients were available. So I had pasta with cherry tomatoes. Very little ingredients though! Unfortunately, the café I had dinner had plastic cutlery… Not so sustainable and also not so comfortable. In Bolzano, I had to take a taxi to my hotel. No trains or busses there. My hotel room was so immensely hot that I switched off the heating completely and took off my vest (and I never take of my vest!). Not sustainable at all. Who wants a hot hotel room? I should actually say something about that to the reception guy, but that makes me feel such a bore! Do escalators use significantly more energy when people are standing on them (I mean escalators that are working anyway, not those that are not moving when no one is using them)? How long could you politely stay seated in an airport café (and use the power socket) after buying one drink? A short update of my experiences at work. Today I had another meeting with sandwiches, and guess what, not a single vegetarian sandwich! Meat and fish only! So I had a dilemma. Normally, I do eat fish, but I don’t eat meat. This year I wanted to eat purely vegetarian. I had two options (besides not eating anything at all, which was not an option): call the situation an emergency and eat fish after all, or remove the ham from a ham & cheese sandwich (with the obvious disadvantage of ham taste on my cheese sandwich). I chose the fish option, but I regretted it a bit afterwards. Next time I’ll remove the ham in the hope the persons ordering and delivering the sandwiches see it as a sign that not everyone likes to eat meat! I did have the opportunity to make the right choice for drinks by the way. In the meeting room were loads of canned and bottled juices, sodas and waters, but also a thermos of coffee and a can of tap water. So I drank coffee and tap water! No waste. Tomorrow will be a more challenging day. I’m flying to Italy for a meeting. I have a terribly long stayover at Rome, and I’m not allowed to bring my own bottle of water. I’ll bring lunch, but I’ll have to buy drinks and dinner I’m afraid. 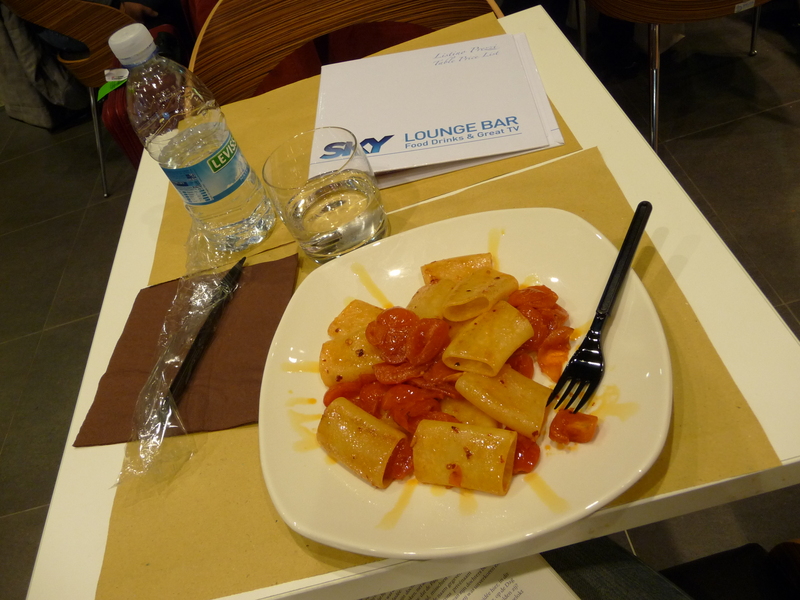 Let’s see what Rome Fiumicino airport has to offer in terms of sustainable food! We’re two days into our experiment! Happy new year to everybody! The first of these days is not really worth mentioning, consumeless and sustainability-wise. We spent New Year’s Eve at friends in The Hague and New Year’s Day at Eise’s family. We went home after dinner so we didn’t have to purchase anything ourselves yesterday. 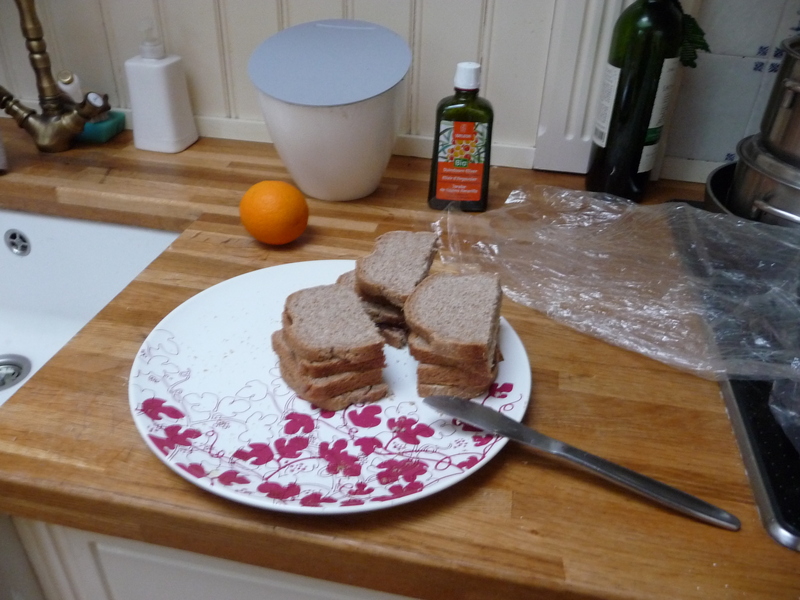 We did however leave for The Hague right before lunch time on Thursday, so we brought our own sandwiches! Consumeless act number one. Today was more of a day according to our new lifestyle. We did nothing special (doing some new year’s cleaning) and there were hardly any moments we had to think twice before doing something. We did buy six energy saving light bulbs to replace the last ‘normal’ bulbs in our house. And Eise had to go to both the supermarket and the organic food store (in stead of the super market only) to buy organic ingredients for our food this weekend. 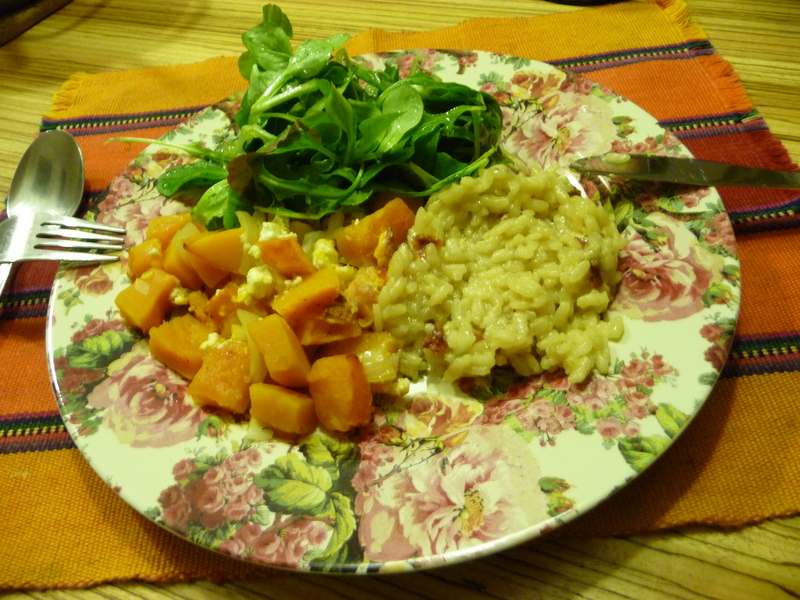 We had dinner completely according to our rules: we ate pumpkin, with onions, garlic and goat’s cheese (all organic) from the oven, risotto (not organic, but we still had it in stock) and (organic) salad. A related problem would arise (we just thought) when we want to heat something to drink. In winter, we like to drink hot apple juice with cinnamon (De Werf-style). What would be better: heating the apple juice in the microwave oven or in a pan on the stove? We have a halogen stove, but I have no clue whether heating something on this stove requires more energy than heating it in the microwave oven. It’s not so easy, this applying consuming less and consuming sustainably to all aspects of our daily life! A question that was asked a couple of times the last few days was how essential we thought visiting family and friends was (refering to our first rule, saying we only buy things if we really need them). We haven’t made up any rules about this except for the transportation rules. We have been thinking about this issue and decided not to make a special rule for this. The idea of this experiment was to try to live our lives as consumeless and as sustainably as possible, and our lives include visiting family and friends. Of course we will keep the transportation rules in mind all year! Finally, a shocking fact I just came across reading National Geographic’s Green Guide (which I found in our stack of magazines I was sorting out), related to cotton production (which we’ve dicussed in the post Inspiration as well): “Conventional cotton production uses more than 18 percent of the world’s pesticides”! We’re seriously considering to never buy any other cotton than organic cotton in the future. Which is not too difficult anymore. Most mainstream stores (H&M, C&A, HEMA) have cotton basics these days. And buying organic jeans is not difficult as well (Kuyichi, Levi’s, Ascension, and probably many more). So, this really is the start of our experiment to live as consumeless and as sustainable as possible for a year. We hope to hear from all of you, so please let us know what you think of our rules, our experiences and our blog! We are happy to receive any tips and suggestions!